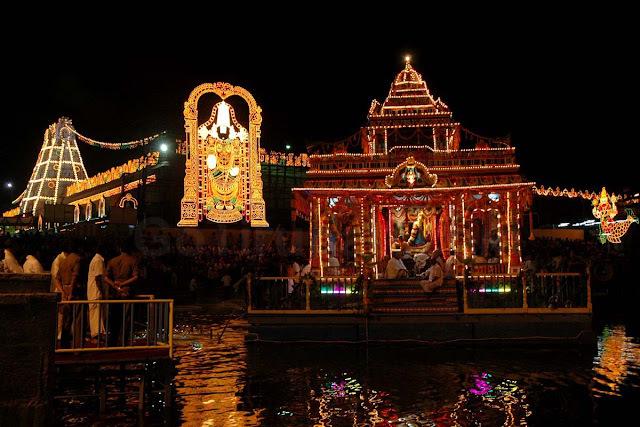 Every year during Phalguna Pournami, this festival is celebrated on a grand scale in the Swami Pushkarini for five days. On the first day, Lord Rama with Sita and Lakshmana is offered worship. On the second day, Sri krishna and Rukmini are offered puja. During the remaining three days beginnig with Trayodadi and ending with Pournami, Sri Malayappa Swami along with Sridevi and Bhudevi are worshopped. The utsava murtis are impressively decorated on thehse days and taken on a beautiful float specially erected in the Pushkarini. Arjita seva ticket holders can have darsan of the Lord after the festival.